"More Cowbell"[a] is a comedy sketch that aired on Saturday Night Live on April 8, 2000. The sketch is presented as an episode of VH1's documentary series Behind the Music that fictionalizes the recording of the song "(Don't Fear) The Reaper" by Blue Öyster Cult. The sketch featured guest host Christopher Walken as music producer "The Bruce Dickinson", and regular cast member Will Ferrell, who wrote the sketch with playwright Donnell Campbell, as fictional cowbell player Gene Frenkle, whose overzealous playing annoys his bandmates but pleases producer Dickinson. The sketch also starred Chris Parnell as Eric Bloom, Jimmy Fallon as Albert Bouchard, Chris Kattan as Buck Dharma and Horatio Sanz as Joe Bouchard. 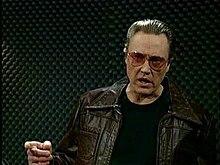 "The Bruce Dickinson" (Christopher Walken) demands "more cowbell." The sketch is often considered one of the greatest SNL sketches ever made, and in many "best of" lists regarding SNL sketches, it is often placed in the top ten, being ranked number nine by Rolling Stone. As a result of its popularity, "more cowbell" became an American pop culture catchphrase. An episode of VH1's Behind the Music documenting the band Blue Öyster Cult showcases footage of the group from a 1976 recording session that produced the band's biggest hit, "(Don't Fear) The Reaper." The producer (played by Christopher Walken) introduces himself as "The Bruce Dickinson" and tells the band they have "what appears to be a dynamite sound". The first take seems to go well but the band stops playing because the cowbell part is rather loud and distracting. Dickinson, to the surprise of most of the band, asks for "a little more cowbell" and suggests that the cowbell player, Gene Frenkle (Will Ferrell), "really explore the studio space this time". Frenkle's exuberance in following this advice causes him to bump into his bandmates as he dances around the cramped studio, thrusting his pelvis wildly in all directions, and the band aborts another take. Frenkle sheepishly agrees to tone down his performance in the spirit of cooperation. He passive-aggressively plays the cowbell very close to Eric Bloom (Chris Parnell)'s ear and fails to keep time with the rest of the band. The rest of the band expresses frustration with Frenkle, but Dickinson remains focused only on getting more cowbell onto the track. Frenkle makes an impromptu speech to the rest of the band, declaring that Dickinson's stature lends a great deal of weight to his opinion about the cowbell part and that the last time he (Frenkle) checked, they didn't have "a whole lot of songs that feature the cowbell" and therefore he would be "doing himself a disservice, and every member of the band" if he "didn't perform the hell out of this". In the end, the band agrees to let Frenkle play the cowbell part his way. The sketch ends with a freeze frame on Frenkle with the superimposed message: "In Memoriam: Gene Frenkle: 1950–2000." Jimmy Fallon as Albert Bouchard on drums (incorrectly referred to as Bobby Rondinelli, the band's drummer at the sketch's airing). Chris Kattan as Buck Dharma on guitar. Chris Parnell as Eric Bloom on lead vocals and guitar. Horatio Sanz as Joe Bouchard on bass guitar. Christopher Walken as music producer "The Bruce Dickinson". Will Ferrell, seen here in 2010, wrote the sketch. Will Ferrell's idea for the sketch came from hearing "(Don't Fear) The Reaper" over the years: "Every time I heard [the song], I would hear the faint cowbell in the background and wonder, 'What is that guy's life like?'" He co-wrote the sketch with friend and playwright Donnell Campbell. Ferrell first submitted it for the episode with Norm Macdonald as host, which aired on October 23, 1999. SNL creator and executive producer Lorne Michaels was unsure about the premise, though the sketch played well among crew at the table read. According to Seth Meyers, who served as head writer several seasons later, the sketch was submitted over seven times before making the show. Ferrell re-wrote the sketch when Christopher Walken was scheduled to host to fit the actor's rhythm. The sketch was put near the end of the episode, where more offbeat/odd sketches often air. The actors who appeared in the sketch had trouble keeping straight faces. They found Ferrell's acting, along with Walken's stone-faced performance, so funny that they were all on the verge of breaking up laughing and ruining the sketch several times. On "Take Two," Walken can be seen through the booth glass, laughing, as Ferrell's too-tight shirt rides up, exposing Ferrell's stomach while he is dancing and playing the cowbell. Even Ferrell at one point can be seen laughing for a moment soon after Jimmy Fallon laughs for the first time in the sketch. According to Fallon, Ferrell wore a tighter shirt in the live sketch than he wore at dress rehearsal to allow his gut to hang out, in turn making Fallon laugh. The sketch has the recording session taking place at Sunshine Studios in late 1976. In reality, the song was recorded at the Record Plant in New York City, in late 1975 or early 1976 (the album the song first appeared on, Agents of Fortune, was released in May 1976). Parnell plays the group's lead singer, "Eric". While Eric Bloom was the band's lead singer, Roeser performed lead vocals for the song. Drummer Albert Bouchard is incorrectly referred to as "Bobby", and keyboard player Allen Lanier is notably absent. Gene Frenkle is a fictional character invented for the sketch, although his appearance was modeled on Eric Bloom's appearance at the time. Despite the fact that Frenkle is fictional, fans occasionally express their sympathies to Blue Öyster Cult over his death. Christopher Walken portrays producer The Bruce Dickinson, not to be confused with the Iron Maiden vocalist of the same name. Dickinson was not the actual producer of "(Don't Fear) The Reaper." The song was produced by David Lucas, who had discovered the band and produced their first album, and also Agents of Fortune and Spectres. The actual Bruce Dickinson was a mid-level manager at Columbia Records whose name appears on a Blue Öyster Cult reissue CD and a greatest hits compilation as the "reissue producer". The SNL intern who was sent out to get the record got a "hits" compilation CD instead of Agents of Fortune. Ferrell later revealed that a woman working in the art department of SNL was the daughter of a man who worked on Agents of Fortune. She reportedly told him that the band had seen the sketch and said the actual cowbell player in question was not unlike Ferrell's interpretation. Producer David Lucas, on his website and in interviews when he was inducted into the Buffalo Music Hall of Fame, says that he was the one who played the cowbell. The sketch's offbeat nature, as well as the actors breaking character, made the sketch an immediate fan favorite. Marc Spitz called it "one of the first super-memes of the new century" in the New York Times. Walken continued to hear from fans about the sketch in years afterward: "I hear about it everywhere I go. It's been YEARS, and all anybody brings up is 'COW-bell.' I guess you never know what's gonna click." Members of Blue Öyster Cult were positive regarding the sketch. Though the song was previously well known for its creepy tone, co-vocalist Buck Dharma said that "Ferrell pretty much sabotaged that." The sketch was referenced on various episodes of SNL in years to come. On May 14, 2005, on an episode that Will Ferrell hosted, the Gene Frenkle character made a reappearance on the set of Saturday Night Live as musical guest Queens of the Stone Age played their first song of the night, "Little Sister" – which features a jam block, an instrument similar to a cowbell. In his Gene Frenkle costume, Ferrell played the song's jam block part using a large cowbell along with the band, drawing much applause. Promotions for the April 5, 2008 Christopher Walken/Panic! at the Disco episode of Saturday Night Live referenced the "More Cowbell" sketch. The cowbell did not appear during the actual episode. At the end of the May 16, 2009 Will Ferrell/Green Day episode, Green Day performed "East Jesus Nowhere" with Ferrell on the cowbell. Ferrell's appearance was unrehearsed and it was unknown to Green Day that Ferrell would appear. Additionally, Ferrell was unfamiliar with the song and not aware of the sound-break near its end. As the sound-break continued, Ferrell elaborately played single "final" cowbell beats, expecting the lights to fade, then began to leave the stage. Lead singer Billie Joe Armstrong called him back, saying, "Wait, goddamn it!" and began his vocal. Ferrell came to the microphone and asked, "Wait, is this song still going on?" Laughing, Armstrong answered, "Yes." Ferrell guest-starred on the final episode of The Tonight Show with Conan O'Brien, playing cowbell in reference to the sketch. Ferrell appeared in the 2011 video for "Make Some Noise" by the Beastie Boys, in the front of a limo, playing a cowbell. Ferrell and Red Hot Chili Peppers drummer Chad Smith appeared on the May 22, 2014 episode of The Tonight Show Starring Jimmy Fallon for a charity drum-off battle. Despite Smith clearly giving the better performance, Ferrell was named the winner and awarded a giant gold cowbell. Both were joined by Smith's Chili Peppers bandmates for a performance of "(Don't Fear) The Reaper" with Ferrell playing cowbell. At Ferrell's all-star cancer benefit concert Best Night of Your Life on October 6, 2018, Ferrell joined Coldplay's Chris Martin on cowbell for the song "Viva la Vida." In St. Charles, Missouri, a marathon/half marathon race is held annually called MO’ Cowbell. The race name was inspired by the SNL skit. ^ The sketch is listed by the title "Recording Session" in a 2017 Rolling Stone special, though it is listed on NBC's official website and in most other sources as "More Cowbell". ^ a b James Andrew Miller & Tom Shales (September 2014). Live From New York: The Complete, Uncensored History of Saturday Night Live as Told by Its Stars, Writers, and Guests (2nd ed.). Little, Brown and Company. p. 537. ISBN 978-0316295048. ^ a b c d e "My Favorite Sketch". Rolling Stone: Saturday Night Live (Special). Wenner Media Specials. September 16, 2010. ^ "9. Behind the Music: Blue Oyster Cult". 50 Greatest 'Saturday Night Live' Sketches of All Time. Rolling Stone. February 3, 2014. Retrieved 2015-02-15. ^ Rich Cohen (September 16, 2010). "The Godfather of Studio 8H". Rolling Stone (1113). ^ Reiher, Andrea (Mar 15, 2014). "Jimmy Fallon and James Franco laugh about 'more cowbell' sketch from 'SNL' on 'Tonight Show'". Zap2it. Retrieved September 7, 2015. 'You always cracked up!' says Franco. ^ Winter, Jessica (July 25, 2013). "When Is It OK to Crack Up? Some Ground Rules for the Cast of SNL". Slate. Retrieved September 7, 2015. ^ Dave Lifton (June 27, 2012). "Jimmy Fallon Recalls Famous Blue Oyster Cult / 'More Cowbell' Saturday Night Live Skit". UltimateClassicRock.com. Retrieved February 11, 2017. ^ a b c Farhi, Paul (January 29, 2005). "Blue Öyster Cult, Playing Along With 'More Cowbell'". Washington Post. Retrieved 2007-01-03. ^ Sauro, Tony (September 17, 2009). "Blue Oyster Cult's innovative use of a cowbell will never be forgotten". The Record (Stockton). ^ a b Arena, Joe (June 30, 2011). George, Eli, ed. "Blue Oyster Cult cowbell ringer honored". Buffalo, NY: WIVB-TV. Archived from the original (text, and video clip) on 2011-07-02. Retrieved 2011-07-02. ^ a b "He Really Did Want That Cowbell". Just my Show: Retro Pop Culture Podcast. July 15, 2011. Retrieved 2011-07-19. ^ a b "'(Don't Fear) the Reaper' Is a Creepy Tune, Even With the Cowbell". The New York Times. May 20, 2016. Retrieved February 11, 2017. ^ "Nobody Does It Like Walken" by Roger Moore, Orlando Sentinel, October 25, 2004, p. E1. ^ Newman, Jason (May 23, 2014). "Chili Peppers Surprise Will Ferrell, Chad Smith Drum-Off on 'Fallon'". Rolling Stone. Retrieved May 23, 2014. ^ Kaplan, Ilana (October 7, 2018). "See Coldplay's Chris Martin Perform 'Viva La Vida' With Will Ferrell on Cowbell". Rolling Stone. Retrieved 2019-02-24. Wikimedia Commons has media related to More cowbell. Even More Cowbell! – Timeline of events from Wired magazine.